Perhaps the most popular and well-known saltwater inshore conventional reels in the world, Penn's General Purpose Round Levelwind Reels are ready for action. From flounder and stripers to snapper and grouper, these high-performing reels never fail to satisfy. "i just got this a couple days ago ive only gone fishing once with it and i caught a kingfish with it it felt like it was nothin on the reel overall its a great reel and very easy to use"
"I bought this reel because the reel's price caught my eye. The spool has plenty of room to get enough line on it. The drag is within thumbs reach. The drag is loud enough to hear over any kind of noise. 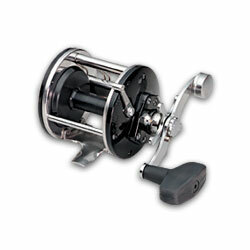 The reel is good for any kind of fishing, and works well in any kind of situation."